...and it doesn't look like there's any way of changing that. Part of the appeal of League of Legends is that it’s a social game. Sure, there are the people who will sit down and solo grind the ladder to test their own skills, but most people who get into the game do so to play with a group of friends. Riot realizes that even the competitive players have the desire to play with like-minded folk. Their promotional video Warriors, set to the tune by Imagine Dragons, is about a group of friends dreaming that they’ll attend Worlds one day. The goal of going pro is a much dimmer prospect if it’s a path you take alone. The recent video Ignite, another Worlds anthem by Zedd, celebrates the beautiful moments between teams as they compete at the top. At all levels of the game, from those pre-level 30 clown fiestas, to the very highest levels of play, Riot likes to emphasize the team aspect of the game. And so, there are scores of people who get into the game to play with friends. Little do they know that League of Legends is a game that hungers for your friendships. Every time you queue up with a friend, the nightmare carnival begins anew. League of Legends may reach across the globe, but it has become a game that is untenable as a way to unwind—or even seriously compete at—with friends. Let’s talk about why League of Legends puts pressure on even the strongest friendships. You’re in the game for at least twenty minutes, and you can’t surrender before then. Even the surrender system is a horrifying way to strain what you thought was a perfectly great friendship! You don’t know true suffering unless you’re in a game, getting dunked on over and over, and you watch two red lights ping up on the surrender vote. You realize that you’re trapped in a game with people who don’t admire your time. It’s like watching Golden Labradors playing, insisting that their Vayne will scale up and we can totally win this, guys! Meanwhile, you stand there, the tired adult who has to go to bed for work in the morning, and realize you have a fundamental incompatibility of values. Every time you die, you get to relish the icy silence on voice chat as everyone tries to ignore the fact that you just died and gave the enemy team a huge leg up. Or maybe there’s that one guy who has to point out that there’s an advantage. What started out as a fun way to spend the evening with friends quickly devolves into a hostage situation, where you all have to engage in the polite fiction that this is fantastic, and you’re all better off for engaging in this experience, and as soon as someone raises a voice it’ll all go to hell. But don’t worry! As soon as that forty minute game is done, your team will probably agree that the next game will be better, and you’ll queue up again. The next game is never better. This is a story where he can be argued as being in the right. My husband played League of Legends with the joy and wonder of a child. In many ways, I envy him. He has the capacity to look at items and decide what is “cool”, as opposed to the world weary approach of picking whatever’s currently in the meta. And yet we were completely incompatible, and there was no way to bail out. I had to sit there, watching our death toll in bot lane rack up, as he mentioned that Twisted Fate should probably have a higher attack range because it was pretty hard to murder people in the bot lane. This is the kind of scenario that usually precedes a hypothetical moral choice in a philosophy textbook, but instead this was my date night. This was my real life. Sometimes the differences aren’t so obvious—sometimes you’ll just have someone who likes to play Quinn top, and someone who insists on the tank meta. Either way, it’s very easy for your fun group activity to turn into a debate team on the nature of individual skill versus adherence to the agreed upon meta. Remember that video I linked up above? 2014’s Warriors is widely agreed upon as a great song and video, a celebration of how the game really is made up of the groups of friends who band together and dream crazy dreams like attending Worlds. But, hey, wait, doesn’t one of those characters smash a keyboard? He absolutely does, and this is just treated as normal. Riot know that they’ve invented an infuriating game! Nobody’s breaking their keyboard after a rousing session of Club Penguin! Maybe this is just the online world we live in, now. 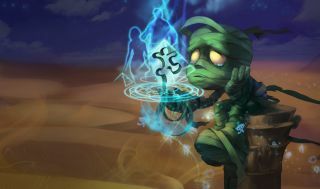 Maybe, as a society, we’ve just accepted that our entertainment has a drastic chance of making us really mad at things including, but not limited to: champion scaling, that guy in top lane, the balance team, our buddy Jake, and Dr. Mundo. At the end of many columns, I offer solutions, or potential ways to mitigate these problems. This time, there is no solution. The game has a design flaw that may never be solved, in that the long games and high stakes create a pressure cooker. There is no moral. Now, if you’ll excuse me, I’m going to go fire up a game of League. Alone. I have an itch to play Quinn top.